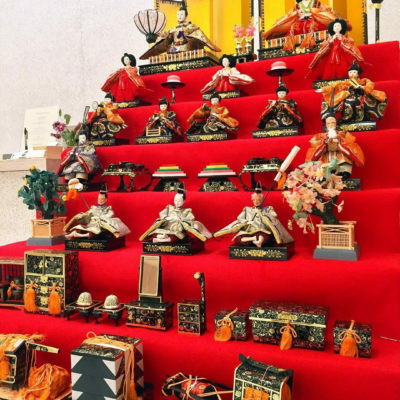 Tai (sea bream or also called tai snapper) is one of my favorite kinds of fish to eat both raw or cooked, and this fish is a symbol of celebration in Japanese culture. So, I love making this dish especially when I want to celebrate. The beautiful pink color of the fresh tai brings out the happy feelings and stimulates appetite. 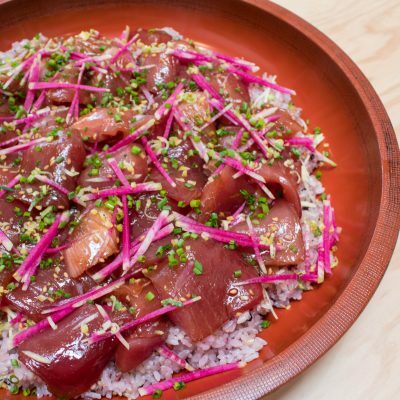 And, as long as you get the high quality sashimi-grade fish and rice cooked in Kamado-san, this dish is basically error-proof and always tastes wonderful. The fish is sliced not too thin, and I like to use a generous amount of it, so I can really enjoy the taste of it. The shiso leaves between the layers of the sushi rice gives nice aromatic quality to the dish, but if you can’t find them, it can be omitted. 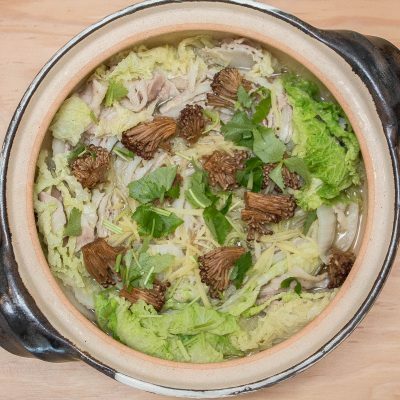 This dish is all about pork and napa cabbage, cooked in a minimum way. 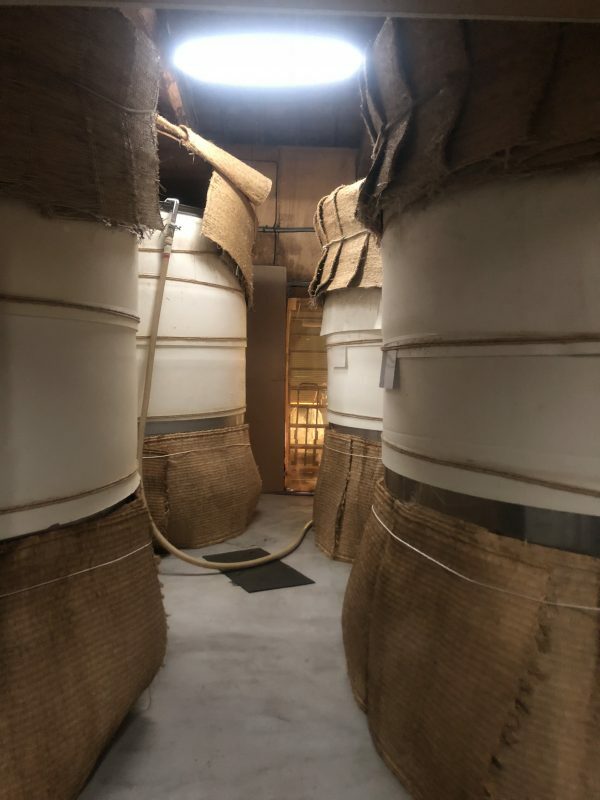 They are simply layered to pack in a donabe, with a small amount of water and sake. There is not even dashi or salt. You can top them with some sliced ginger and mushrooms, and gently simmer for 25 – 30 minutes. The result is a tasty treat rich in umami, and it looks beautiful, too. The soup is also packed with all the natural flavors from the ingredients, so make sure to enjoy it with the dish, too. 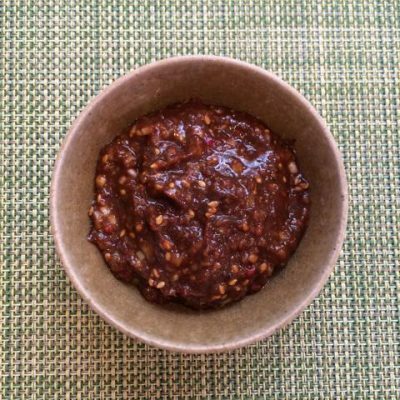 I like to serve it with Sansho Ponzu Sauce and Hatcho Miso & Black Sesame Sauce (recipe below) for flavor variations. Or, you can simply serve it with yuzu-kosho or Kanzuri, too. As I have been to Hawaii almost 50 times since I was a teenager and I’ve been loving their local seafood dishes, I am a self-claimed poke expert (haha). 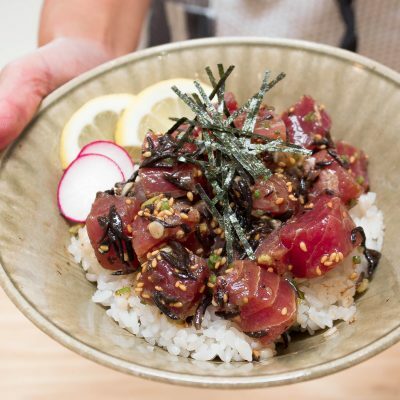 My favorite style of poke is quite simple…it’s all about high quality tuna, soy sauce, sesame oil, and wasabi. When I serve it as an appetizer, I encourage my guests to enjoy on its own or make a wrap with lettuce and nori. To make a meal out of poke, I make this poke don (poke rice bowl). 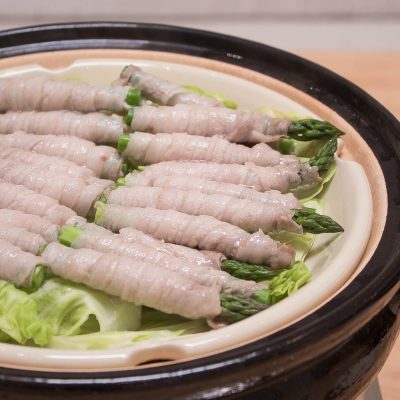 With the sushi rice made in double-lid donabe rice cooker, Kamado-san, this simple dish becomes such a decadent sushi dish you can create at home. I love making this dish while the tomatoes are in season during summer. But, tomatoes don’t have to be very ripe to make this dish, so you can enjoy making this dish any time of the year. Oshi-Zushi (pressed sushi) is always fun to make and is also tasty, especially when the rice is cooked in a Kamado-san. 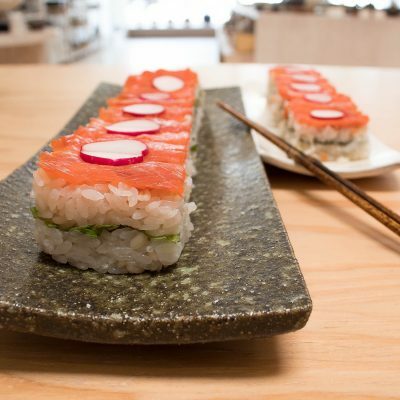 You can see in the photo how each grain retains its shape and is shiny after the sushi is pressed. 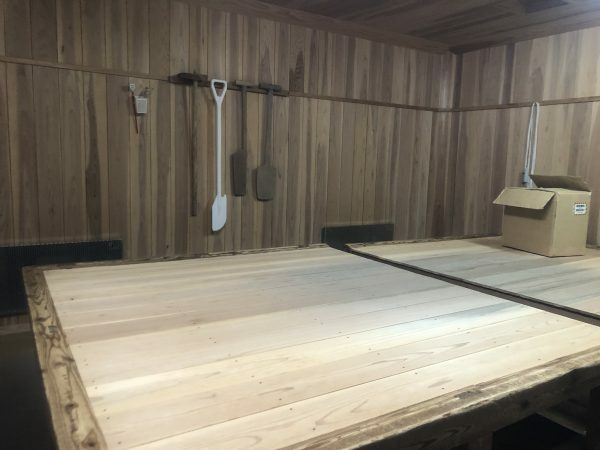 The traditional hinoki wood sushi mold makes the process so easy and brings beautiful results. Here’s my quick oshi-zushi recipe, which can be made with something I normally stock in my fridge…smoked salmon, radish, and shiso leaves. If you don’t have access to shiso leaves, you can substitute with arugula or simply omit it. 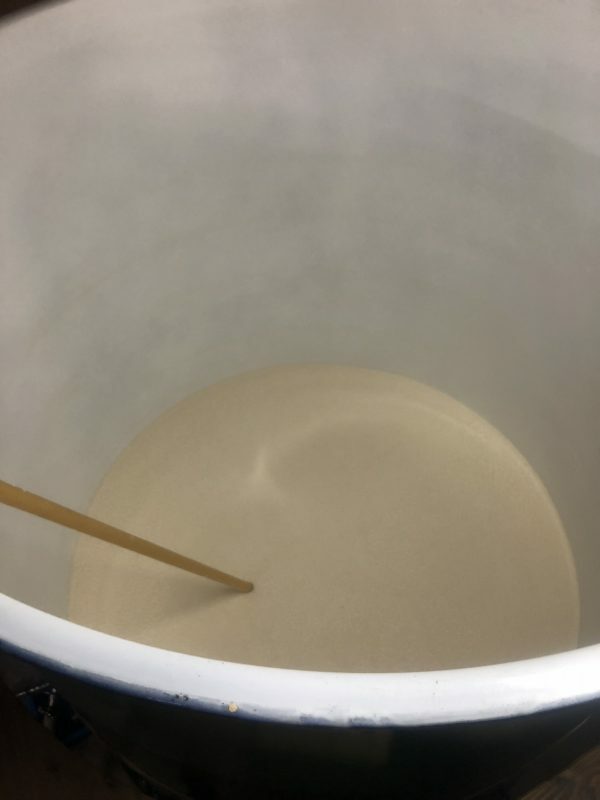 If you want to add Mochi Mugi barley to the rice, simply add a packet of Mochi Mugi to the rice and increase the water by 1/2 cup (120 ml) and cook together. I served this dish with donabe-steamed vegetables during a Summer Festival at the shop and it was such a big hit among the guests. 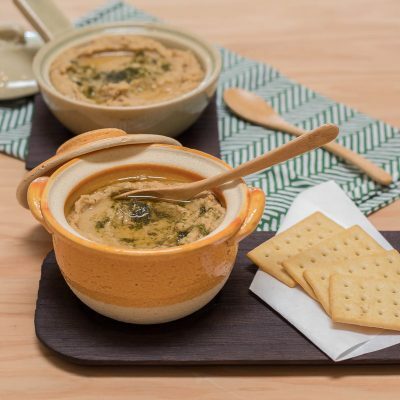 You can (literally) just whip it up with all the high quality pantry ingredients to create this creamy, high-protein dip with rich sesame flavors and aromatic kick from the Stone-Ground Sansho Powder. Besides the steamed vegetables, this dip is also great with sandwiches, steaks, or simply with crackers. Smoked toppings give such a tasty and unique upgrade to the popular summer dish. This dish has not only been a summer hit at my home, but I actually like to make it whenever I want all year round. 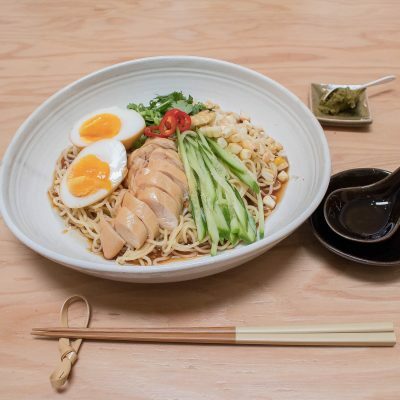 The yuzu-flavored broth is so refreshing and creates a nice balance with the smoked toppings. For me, Yuzu-Kosho is an essential addition to add a nice kick to this dish, but it’s totally optional for those who prefer a less spicy flavor. 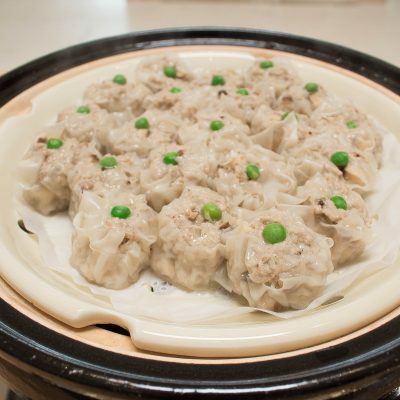 Simple pork shumai dumplings are so easy to make and taste so good that I always have hard time stop eating. The meat becomes so juicy, and with the dipping sauce (combination of soy sauce and rice vinegar) and a little dab of karashi(Japanese mustard), the flavors explode in the mouth. You can make the filling a few hours in advance, and just wrap in wonton skins right before steaming, so the wontons won’t get too wet and sticky. Very thin wontons skins are my choice and they are normally available at Japanese markets. Karashi is very hot, so if you are not familiar with it, try a tiny amount first to see how much you can handle. This dish is very easy to make and always a crowd pleaser. 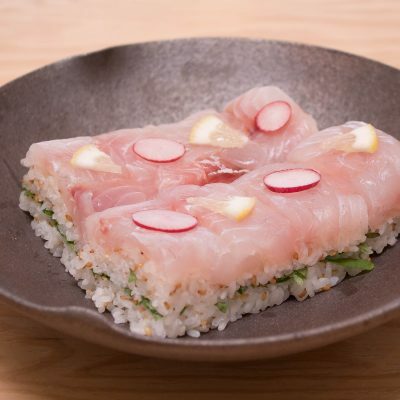 Once you get a block of very fresh tuna, all you have to do is to make sushi rice, slice and marinade tuna, get other small components ready and just assemble. The marinating time of tuna should be just up to 15 – 20 minutes. If it’s marinated too long, it will start to “cook” the tuna and the color could get a bit too dark. 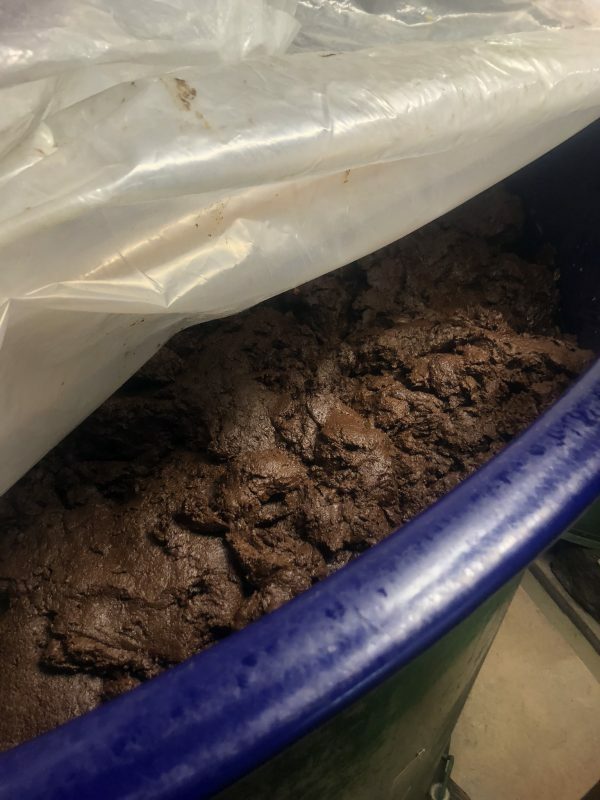 I like to make the sushi rice by adding 16 Multi Mixed Grains for more complex flavor, texture, and beautiful color in the sushi rice, but you can make it without, too. Whenever I make this dish for friends, it disappears in a matter of moments! 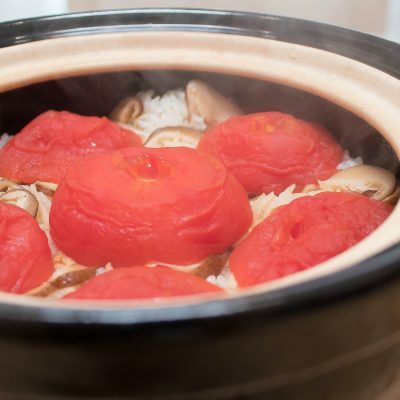 With Kamado-san, you can make really tasty sushi rice with perfectly chewy texture. 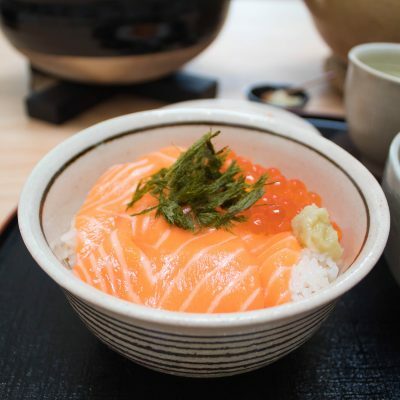 I like making sushi rice bowl and top with whatever the freshest sashimi grade seafood I find at a local market. Salmon and ikura (salmon roe) combination makes beautiful bright visual and always tastes good together. 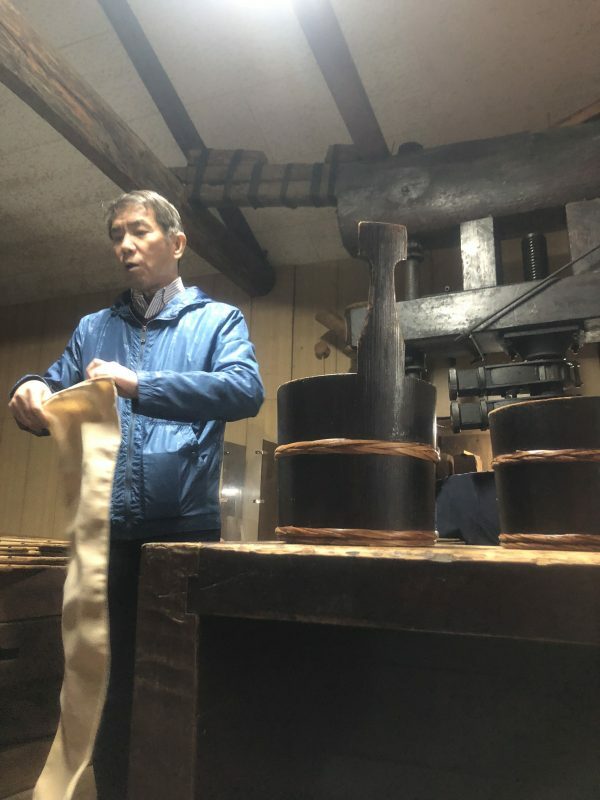 Back in March, I visited Iio Jozo, a 120+ year-old vinegar producer, located in Miyazu, Kyoto. 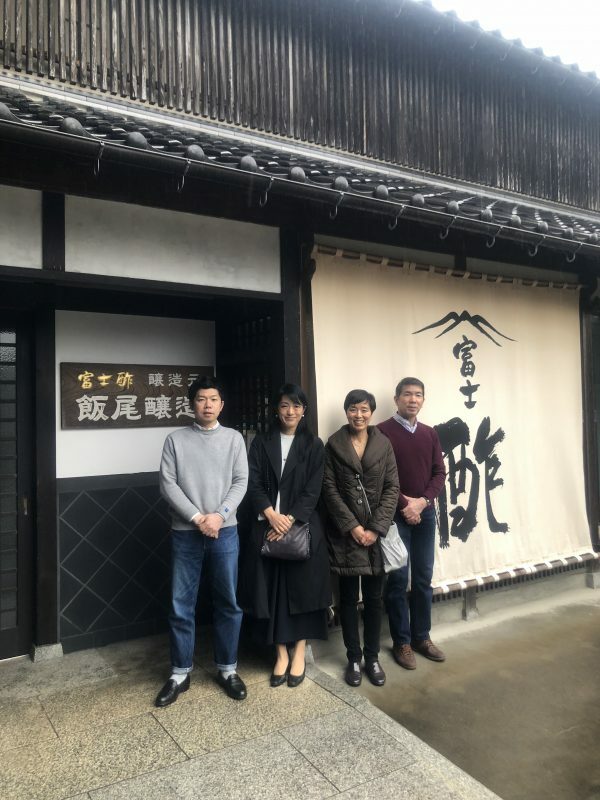 Now the company is run by Akio Iio, the 5th generation of the family. 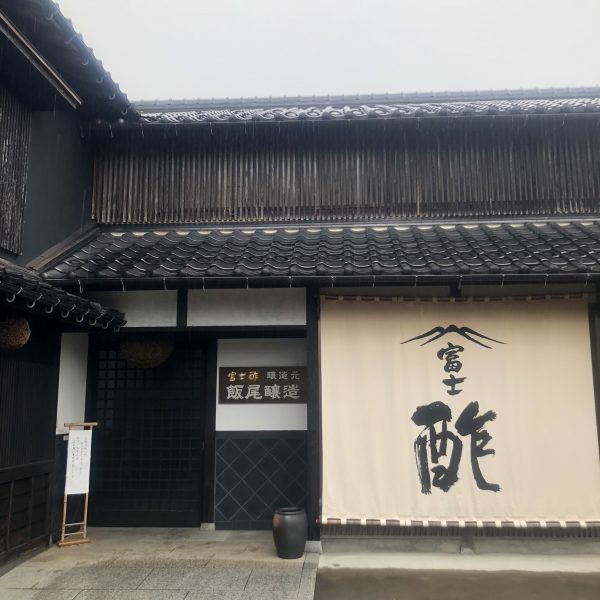 He and his father (4th generation gave us a tour of their sake brewery and vinegar making facility. 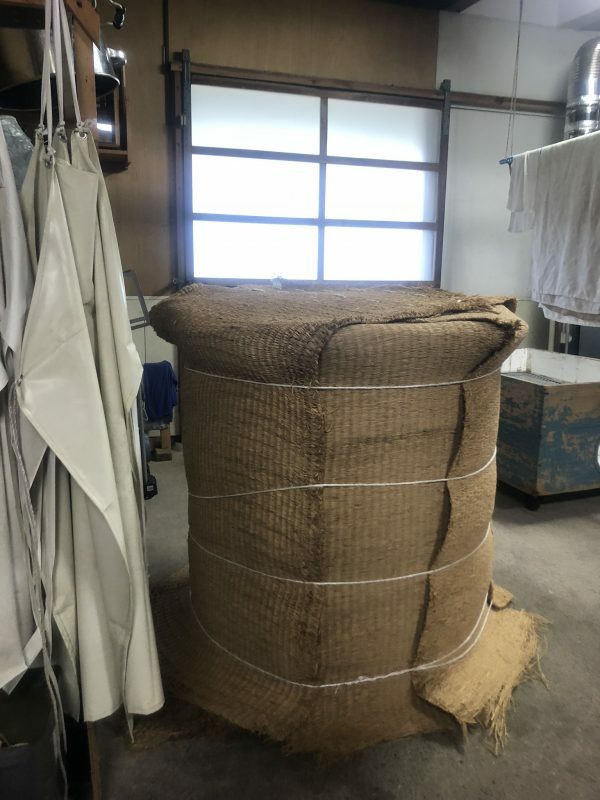 At Iio Jozo, rice for their rice vinegar is cultivated 100% organic by the local farmers and every process of vinegar making, starting from brewing sake, is done by hand in their premises. 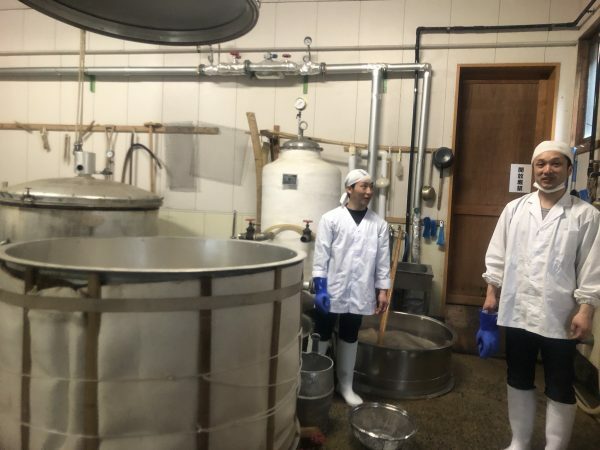 While those conventional (inexpensive) rice vinegar by large producers are often made from cheap sake (made from lesser quality/ old/ broken rice) and takes just one day to produce, at Iio Jozo, their rice vinegar is made from their premium sake and takes about 1 year to make it. 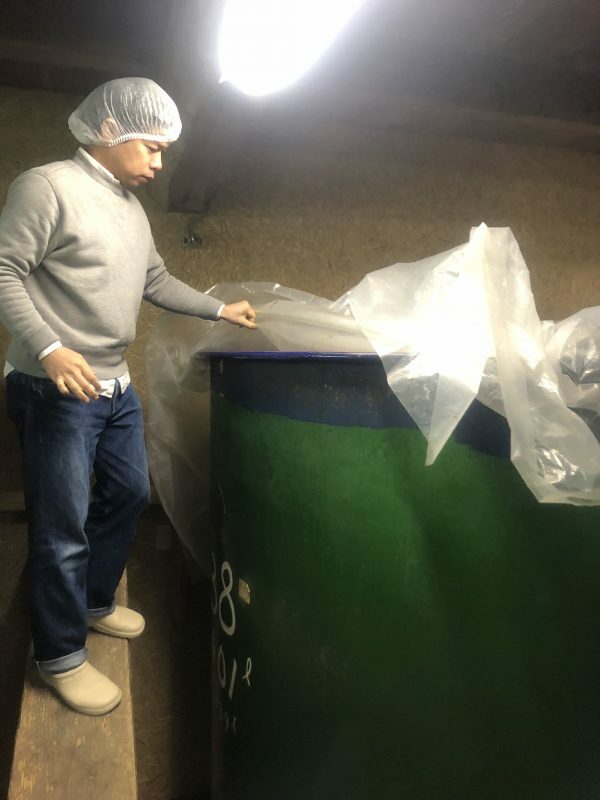 The amount of rice used for making their Premium Rice Vinegar is 320 g/ liter. That’s 8 times as much of the rice normally used for conventional rice vinegar. 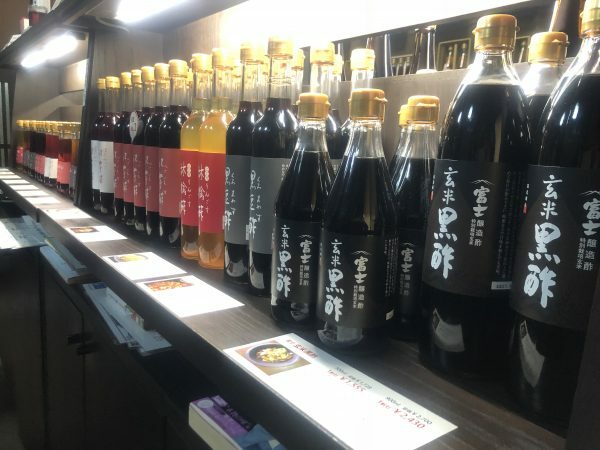 So, their Premium Rice Vinegar has extra rich flavor with round umami. Here are some of the photos from the visit. I’ve been a big fan of Iio Jozo’s vinegars, and after learning so much more about their vinegar making process and philosophy, I love them even more. Iio Jozo’s vinegars are available at TOIRO website.